So Rayman Legends has once again been moved to another set of systems – this time the newly released Xbox One and PlayStation 4. While it’s hard to imagine the game looking any better than it did on the current generation of systems Ubisoft have promised to add new features and improvements to what was one of last year’s best releases. 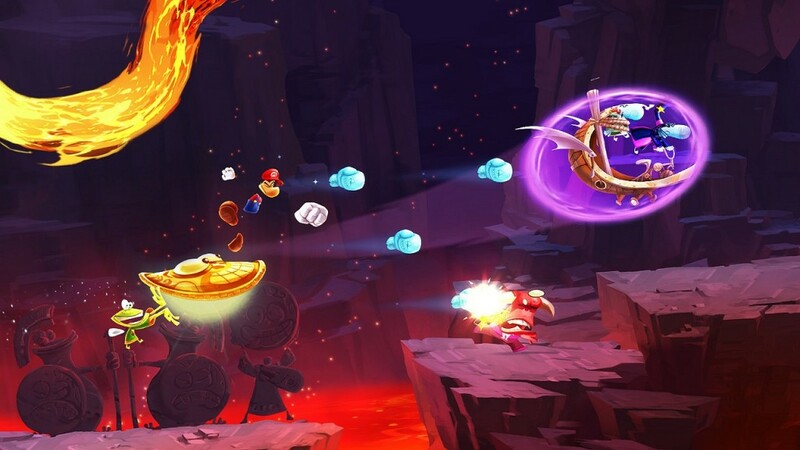 Is Rayman’s latest adventure worth a revisit? For those unaware of the limbless weirdo’s antics, Rayman Legends is a 2D platformer similar to that of the popular New Super Mario series where up to four players all make their way across a series of stages simultaneously. As you can imagine, the more players you add to the mix, the more hectic things become (in a good way). The game handles pretty much like Rayman Origins did. You can still perform all the standard platforming trademarks such as running, jumping and punching along with some more advanced abilities including sprinting up walls and hovering using your helicopter hair (or flapping your arms in Globox’s case). Rayman and his crew are easy to get to grips with and feel extremely tight to control, vital especially with many of the latter more tougher stages. Much like any 2D platformer, Legends features a vast array of stages, all which can be accessed by jumping into paintings in the game’s main hub area. It’s a nice alternative to the usual world map approach and makes for getting to stages a lot quicker- ideal especially for a platformer so fast paced and snappy. The difficulty curve feels just right throughout as well with even the toughest stages never succumbing to frustration thanks to a forgiving checkpoint system that never spawns you too far behind. A majority of the game features stages that simply focus on the platforming alone with Murphy available as an optional extra. Whereas the Murphy specific stages would see one player using the Wii U’s Gamepad to manipulate the environment, here it is handled with a mere button press. While this method works perfectly fine (although it can be a little tough to juggle controlling your character as well as remembering to use Murphy) it’s nowhere near as fun nor intuitive as the Wii U alternative.